The Pearl District, formerly occupied by warehouses, factories, and train yards, now plays host to art galleries, cultural centers, and renowned breweries. Take an educational stroll through Portland’s famed neighborhood and visit three breweries. You'll learn about the history of the area from your guide and sample delicious beers on this 3-hour walking tour. Meet your guide and small group at Deschutes Brewery, where you'll get a full sampling of their wonderful family of beers. From here, it’s a quick walk over to Pints Brewing for another round of Pacific Northwestern brews, all highly drinkable and perfect for an Oregon stroll through the Pearl District. Finally, you'll head to the Rogue Distillery and Public House, a Portland institution and the perfect sign-off to an afternoon of imbibing. If you left beer fans back home, Rogue Distillery is a great place to pick up some take-home bottles and merchandise. 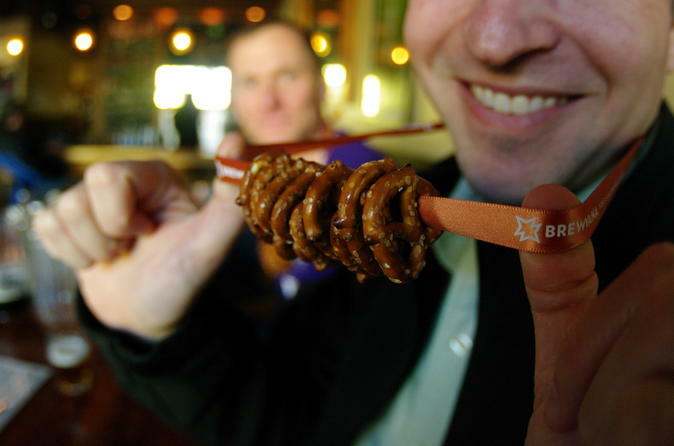 Snacks are provided at the last stop and each participant will leave with a sampling journal, pretzel necklace, and a pilsner glass to take home. Note: This tour does not include a behind-the-scenes tour of any brewing facility. The tour itinerary is subject to change without notice.